TREES RESPOND to wounds by forming boundaries. Boundaries defend the liquid transport, energy storage, and mechanical support systems. Boundaries resist, not stop, the spread of pathogens into wood. Trees resist the spread of pathogens inward from wound (red arrow). We call that direction of resistance wall 2. Once it or color altered wood reaches the pith we no longer have a wall 2. CODIT is a model, you will not see the walls. The CODIT model has 4 walls. 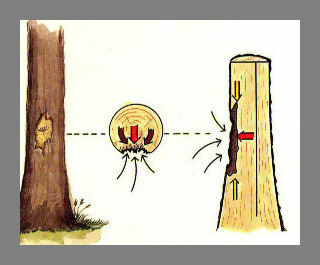 The tree also resist the spread of pathogens in circumference (brown arrows). We call that wall 3. The tree resist the spread of pathogens up and down (yellow arrows). We call that wall 1. The tree sets a boundary representing the size of the tree when it was wounded (black arrows - red line). We call that boundary wall 4 and also the barrier zone. 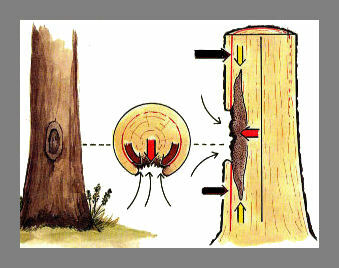 It separates the tree and infected wood from the time of wounding from the tree or healthy wood that grows after wounding. In this drawing the wood outside the red line is what grew after wounding. Inside the red line is wood that was present at the time of wounding. Remove injured bark and wood. Do not enlarge the wound. Do not point vertical tips. Do not paint wounds. WOUND DRESSINGS DO NOT STOP ROT OR DECAY! DO NOT Break boundaries if cavities are to be cleaned. DO NOT Drill holes to drain water or other fluids. Drilling would break boundaries and the presence of the water or other fluids too often stalls decay. Its a niche.